A 4-million second exposure from the Chandra X-ray Observatory is the deepest X-ray image ever obtained. Most of these sources are supermassive black holes; some are billions of years old. How did galaxies form? It’s a cardinal mystery of the early universe. Microwave radiation created 380,000 years after the Big Bang shows a smooth array of molecules, spread out like a fog. The contrast to the situation one billion years later is complete: by then, matter was concentrated in stars and galaxies, separated by empty space. Nowadays, most galaxies hide at least one super-dense black hole, whose gravitation prevents even light from escaping. Until now, nobody knew about black holes in the earliest galaxies. Yesterday, Ezequiel Treister of the University of Hawaii and colleagues reported that most or all of the earliest galaxies also had black holes. The data illuminates the ultimate roots question – how our universe formed its present structure, and in particular, what happened during the billion years after the Big Bang banged about 13.7 billion years ago. For 380,000 years, “During the embryonic universe, the fluctuations in density were about one-one thousandths of a percent, but over a billion years, structures developed,” Alexey Vikhlinin, author of a commentary in Nature, told The Why Files. “These galaxies are essentially the same type of objects in the present universe,” says Vikhlinin, an expert in X-ray astronomy at the Harvard-Smithsonian Center for Astrophysics. How did we go from the primordial fog to a universe with ultra-dense galaxies, neutron stars and black holes separated by a vast nothingness where each cubic centimeter has about one lonely atom? The vast epoch of ignorance, Vikhlinin says, “is called the dark age because little has been observed, and one of the major questions in astrophysics is how this transformation took place.” The new observations show that roughly the same proportion of matter (excluding the enigmatic dark matter and dark energy) was concentrated in galaxies and black holes then as now. 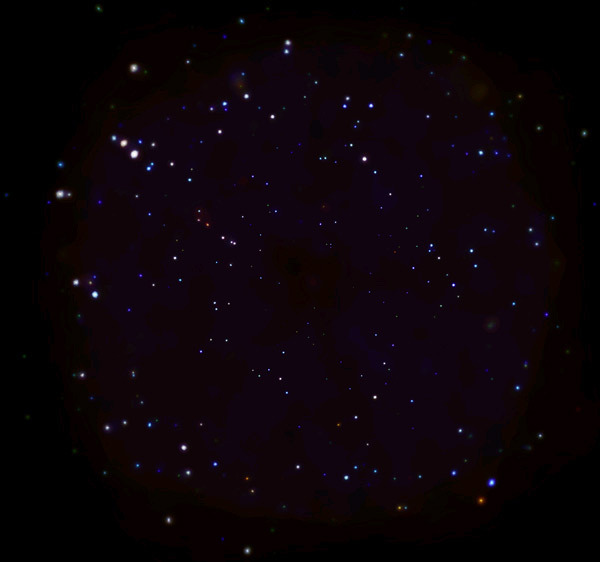 In a small section of Chandra Deep Field South image, X-rays seen by Chandra are blue; galaxies from Hubble are green, blue and red. 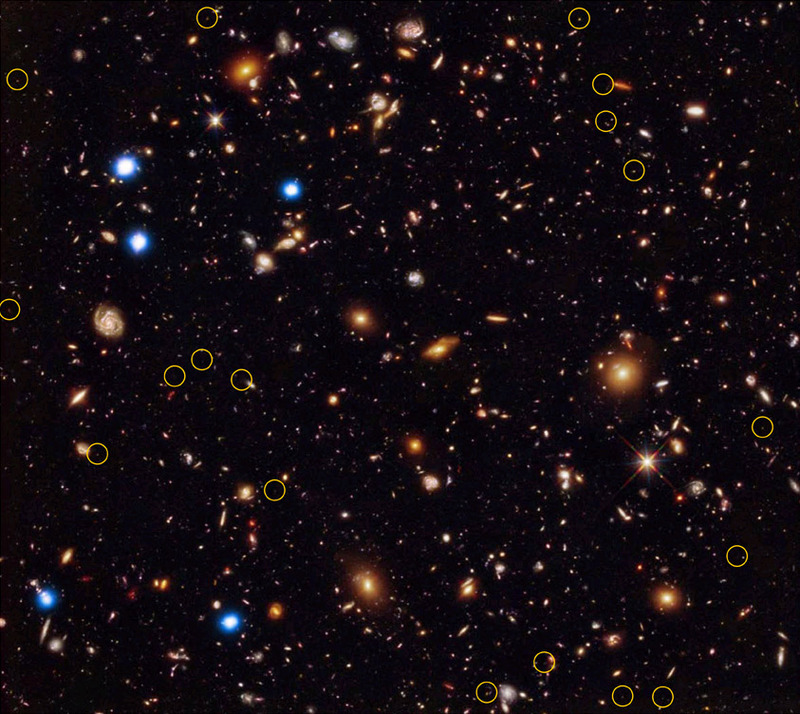 Yellow circles show extremely distant galaxies that existed when the Universe was younger than 950 million years. Chandra X-ray observatory, which picked up X-rays from distant, unidentifiable sources. By pinpointing the source of Chandra’s X-rays on Hubble’s galactic snapshots, the scientists located ancient black holes inside some of the first galaxies. The study benefited from three features, says Vikhlinin. “The necessary Chandra and Hubble data were taken only recently, and the observations were immediately made available to every interested scientist,” along with some money for their interpretation. Most modern galaxies have a black hole at the center. New evidence finds the same relationship just 1 billion years after the Big Bang. Why? The newly detected black holes produced a surprising result – that the basic structure of the universe has not changed terribly much in the 12.7 billion years since that ancient light embarked toward a planet that did not yet exist. 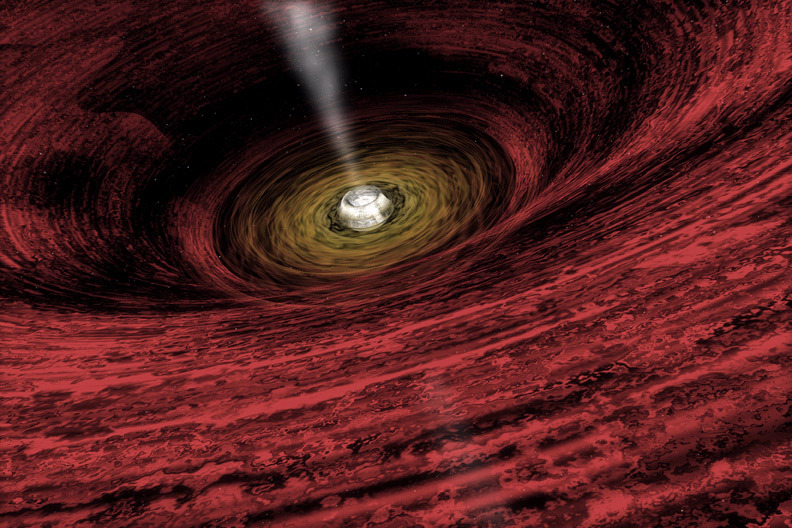 Artist’s view of a supermassive black hole, showing the surrounding material, which will ultimately fall in the hole and release the X-rays that the Treister group studied. A supermassive black hole has the mass of several million suns. Although the new evidence for an unchanging relationship between galaxies and black holes narrows the possible explanations, the formation of the first galaxies and black holes “remains one of the biggest unsolved problems in astrophysics,” Vikhlinin says.